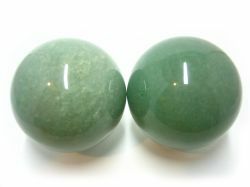 Aventurine is a form of quartz with a beautiful green shine. The tiny mineral inclusions give it a subtle shimmering effect known as aventurescence. Metaphysically, it is believed to bring about a sense of well-being, improve the body's health, enhance creativity, amplify leadership qualities and confidence, boost courage, protect from negativity, reduce stress, and bring good luck and prosperity. It is associated with the heart chakra.